If I had a time machine, I would go back to November 19, 1988 and attend a mid-morning session in the Oakland temple, just so I could whisper to the bride "It will be work, but it will be good work and fun work. And it will work." The bride would probably think, "Go away, strange fat person," but I would smile anyway and then come back home to today and eat a doughnut. 25 years! We've lasted longer than several dishwashers, washing machines, refrigerators, mattresses, TVs, and many many fashion trends. We've upgraded computers and software, but not our spouses. We have not, however, outlasted our children (which is good--I don't think I want to do that). I could make a list of all the things I love about Jim, but some things I can't put into words. And some things I wouldn't want to publicize. And still the list would be too long. And I don't like mushy sentimentality. Let it suffice to say that I wouldn't trade my husband or our experiences together for anyone or anything else. 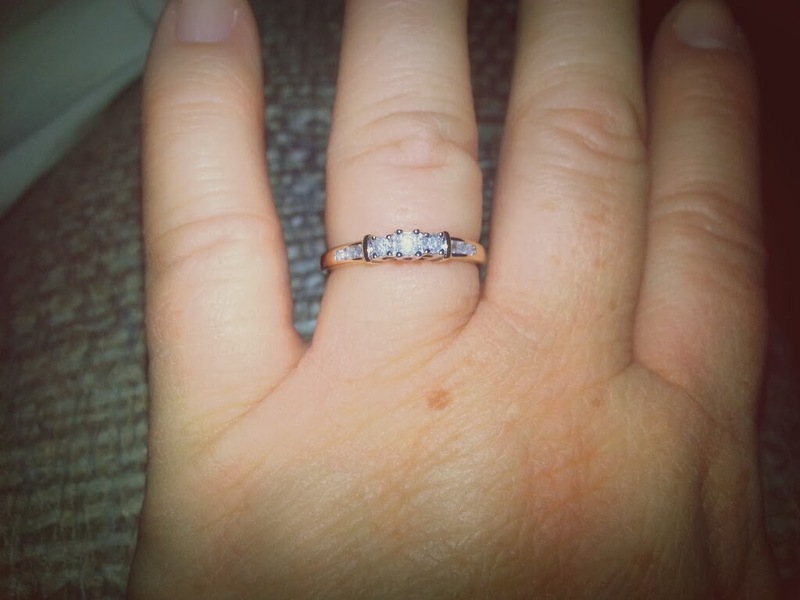 Jim surprised me this morning with a bit of sparkle to celebrate 25 years. I haven't worn my engagement right for over a year because the prongs holding the stone are broken/breaking. I haven't worn my wedding ring lately either because it is a little tight (and I can't stand tight things). It is wonderful to have a symbolic ring on again. It's very sparkly. And if you are wondering what I got him for our anniversary, see my previous post. Wow, 25 years! Happy anniversary! Happy Anniversary. I wouldn't trade Jim for anything either. Remind me sometime and I will tell you about whast you said at your reception (can't be told in this forum). I love you and I love Jim. Happy Anniversary a week and some ago!! I'm only sad that you didn't have that ring when I was there so I could ooh and ahh and take it on a test drive! !